Originally begun as a marketing consortium of local independent restaurants that sold gift certificates online every three months, the Louisville Originals program is now best known for its rewards program that enters its fifth year giving 22,554 cardholders credits at member eateries. While Louisville Originals has gift certificate programs as well, “I think the rewards (card) programs would be, by far and away, the most popular with customers,” said Siobhan Reidy, an Originals co-founder who owns the Irish Rover restaurants with her husband Michael Reidy. For every dollar spent at one of the restaurants, card holders get one point. 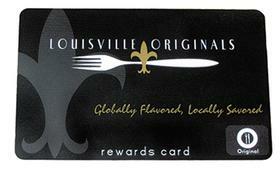 At 150 points, card holders gt a $10 gift certificate — maintained on the card — to use at any of the restaurants. Double points are offered the first Tuesday of the month. There is a 500 point cap for any one visit and no more than $100 in credits can be redeemed by any one person in a visit. Read the full article at Louisville Courier-Journal and learn more about Louisville Originals at the program website.